Marcus Lemonis reflects on the crazy Soup Market episode of "The Profit" on Tuesday night. Published March 25, 2019 at 8:01 p.m. 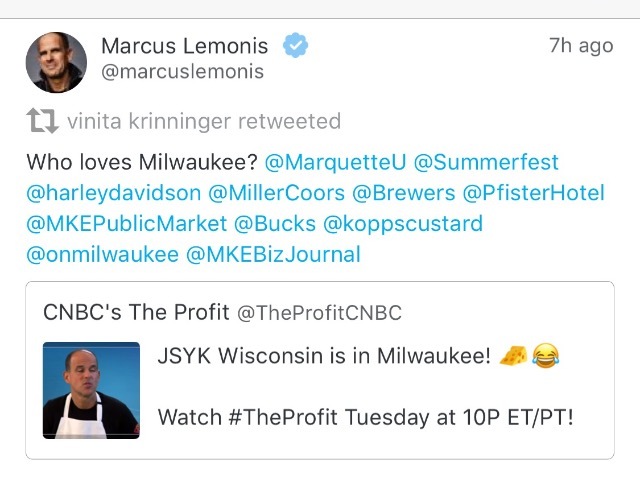 In the summer of 2016, entrepreneur (and Marquette alum) Marcus Lemonis arrived in Milwaukee to film an episode of "The Profit." He left with one of the most infamous storylines to hit his popular CNBC show – and two and a half years later, he's revisiting the drama. On Tuesday night at 9 p.m., "The Profit: An Inside Look" will air a special behind-the-scenes episode with Lemonis and executive producer Amber Mazzola, chatting about the details of one of the show's most famous stories, found right here in Milwaukee. The drama took place at local lunch locale The Soup Market, as Lemonis' usual task of helping restructure and improve a small business hit a peculiar speed bump when Lemonis discovered some odd behind-the-scenes drama at the restaurant involving owner Dave Jurena and a mysterious employee named Grace, eventually revealed to be Grace Ladewig. She was told to stay invisible during the filming of the show, then was fired among the proceedings. And in case you haven't watched the episode, I'll save you from any spoilers – for those, read this rundown from the original episode – but Lemonis discovers even more complications between Jurena and Ladewig, the latter becoming an incidental viral sensation in the process with a hashtag (#WhosGrace) to match. All the more reason to tune in and watch Tuesday night at 9 p.m. on CNBC!